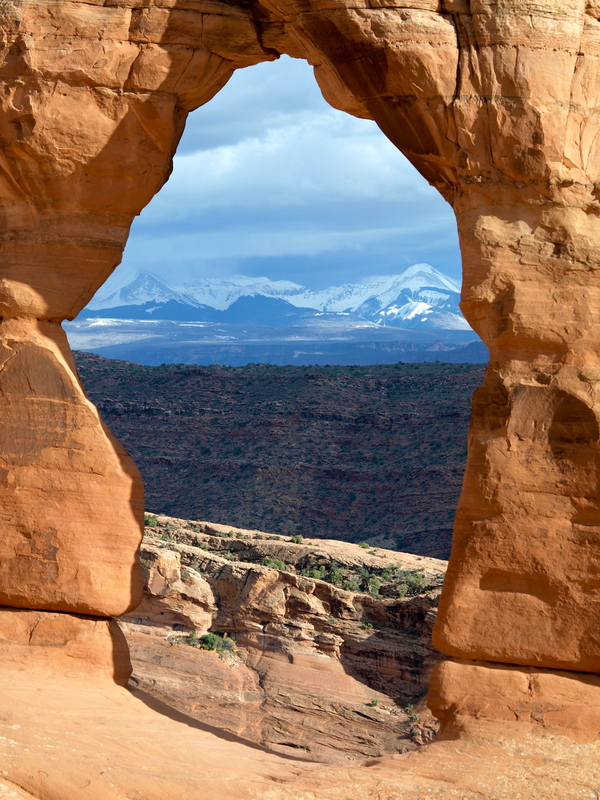 I have a confession: I’ve always kind of avoided Arches National Park. The first time I visited in 2005 it was high summer and the place was sweltering and packed with people and cars. We spent most of the day fighting crowds and traffic and left more frustrated than awed. Tragically, my most vivid memory of Abbey’s beloved country was a vicious headache. Since then, I’ve been back to Moab a few times, but I’ve usually spent my time on the ground elsewhere: Dead Horse Point, Fisher Towers, Canyonlands. Anywhere but Arches. 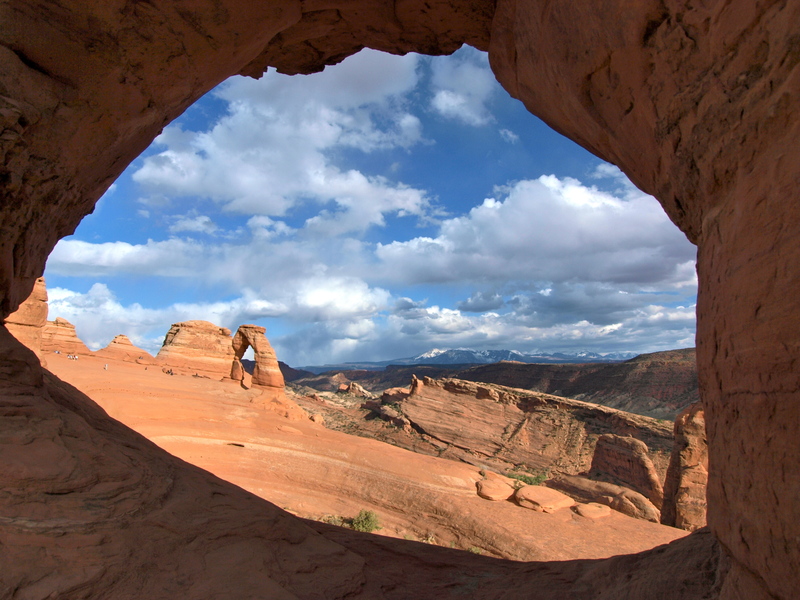 I preferred to know it through Desert Solitaire, written back when Arches was a quieter, little-known National Monument. Over the past two days, I’ve hiked about 12 miles through Arches and now I get it. Yes, it’s crowded as hell – crawling with people – but still absolutely glorious. The light, the space, the rocks, all radiant. As exotic and beautiful as an outdoor place could possibly be, never mind the ants. 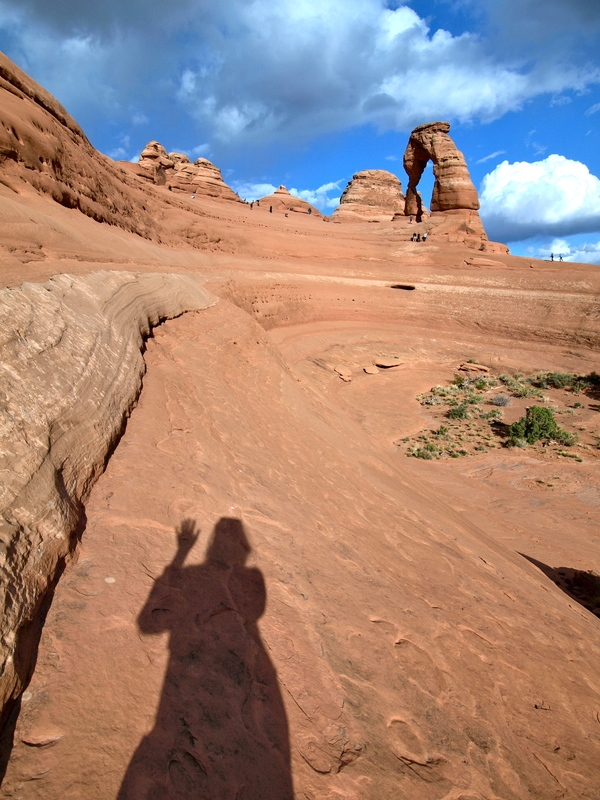 First, I hiked to Delicate Arch. The weather in Moab has been uncharacteristically overcast lately. I’m a firm believer that there’s no bad weather (for photography, at least) and I was hoping the infamously crowded trail to Delicate Arch might have a few less feet on it on a cloudy day. No such luck. On the trail, my mountain legs carried me past dozens of people, families, singles, couples, kids, geezers, all wheezing their way up the slightly sloped trail. People in flip-flops, heeled boots; no water, no supplies. Where do they think they are? At the very least, carry water and wear proper footwear! Show some respect to the sun and the snakes! I have to remind myself to smile, be nice and share. At least they’re out here, out of the car. This might be the only hike they take all year and I can always go hiking alone elsewhere. When I arrive at the arch, there’s no light, so I sit, watch and wait. I’d seen Delicate’s lopsided, bowlegged shape many times, mostly on Utah license plates, but the living thing still stunned me. It was bigger than I had imagined and really not all that delicate. The rock looked like a survivor, a sentinel on that wind-whipped ledge of a grand swirling sandstone bowl, the scenery spilling over into the high red rock desert, the back of beyond, the LaSal Mountains. Watching the arch and the clouds, I saw the right light coming and jumped up. As the clouds moved, so did I. The key to photographing much photographed places is that you’ve got to move, really explore the space, and find your own fantastic angle. Tripods be damned. Move, look, know, see a place. Then maybe you’ll get something different, maybe even something extraordinary. Or this angle? Well maybe, but still pretty cool. You can really see the different types and layers of sandstone here. The pinch point. This rock is amazing. I'm gonna call this an original too. 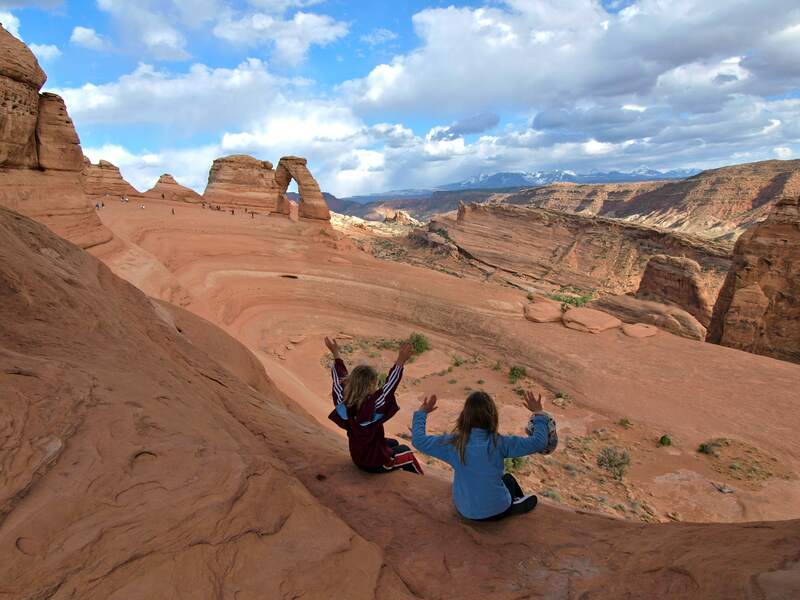 Delicate Arch: definitely no place for desert solitaire, but it was nice to see how people, especially kids, reacted to the place. The wind was whipping across the slickrock and rain was threatening, but Delicate still seemed to evoke great joy and delight from everybody. Maybe we were all lit by the same sense of witnessing a geologic miracle. 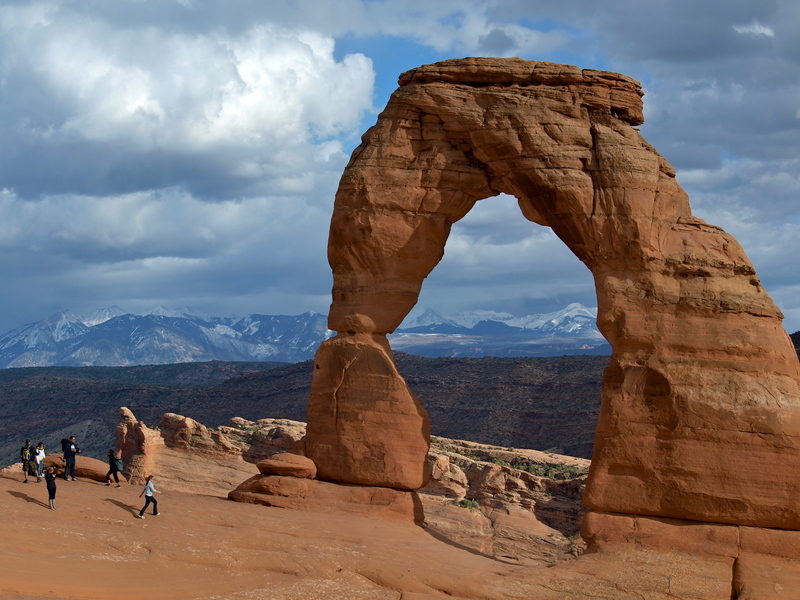 Arches like Delicate have a few thousand year lifespan – not long at all in the grand scheme of geologic time – a gorgeous flash arcing across endless time and space. Delicate Arch, all of these arches, this park, this desert, this place, this planet is something we’re lucky, as a species, to see. More people should see more of the world, even if it means sometimes sharing a crowded trail. 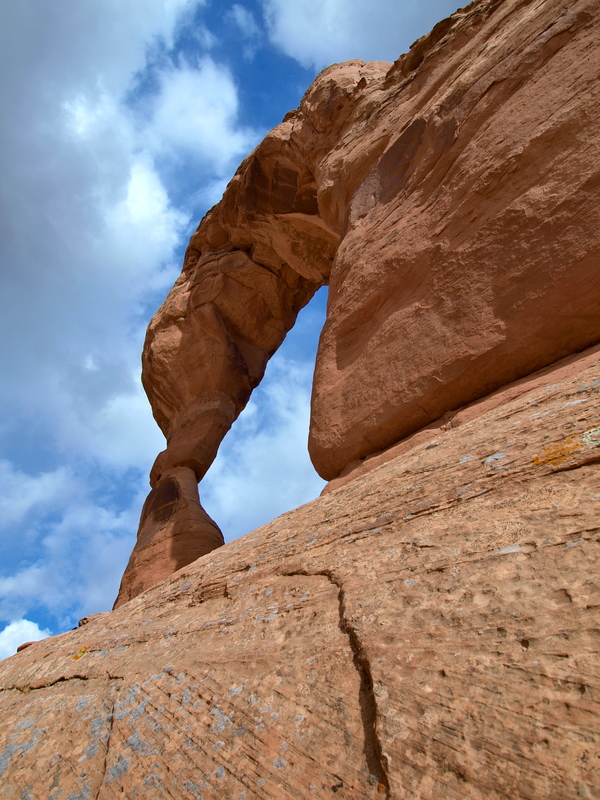 Check back for another Arches post on my morning roundabout loop hike through the Devil’s Garden, tentatively titled: How Not To Get Lost in a National Park. OMG I am so jealous of all of your travels, of your little trailer. Then again, I love having a dependable job and security. Sigh. Oh, to be young again. Enjoy it while you can! Great post! I love the different angles you captured of Delicate Arch, and also your patient rationalization that this might be the only hike many in the crowd take all year… (I might have to adopt that as my mantra next time I’m on a busy trail!) You have a wonderful way of seeing the world, and I am enjoying the chance to follow along with your adventures. My sentiments exactly! I tend to get annoyed with “all those people” in the way of my photography, but need to adopt a more patient understanding way of looking at the situation. I am sure you know the story that the names got mixed up and this one was supposed to be called “landscape arch” (I think…). The actual Lamdscape Arch is much more delicate but doesn’t frame a view of the landscape. M and I saw Delicate Arch from across the gorge (if that’s the right word) as our guide book suggested the hike to the base of the arch was not safe for little ones (M was 7). Probably a mistake to take that advice (M is feisty!). But it was at least quiet and peaceful over the other side and a lovely spot to experience the end of the day. Beautiful photos, particularly the self-portrait. Thank you for bringing a bit of Utah to Pennsylvania this morning. Stunning Photo’t of those arches,so breathtaking I felt almost there ( I wish). Thanks for sharing your travels. Arches is one of my favorite parks. Great photos! Thanks for sharing. 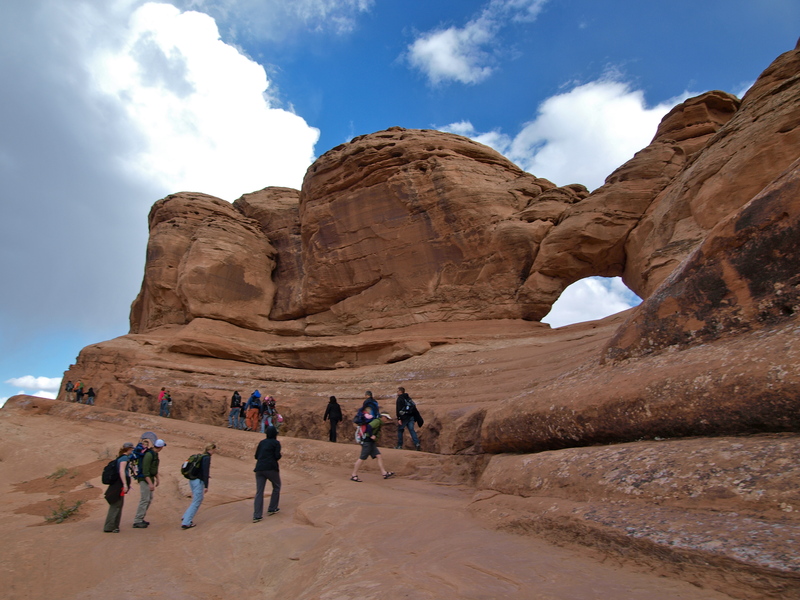 I was in Arches a few years ago and I had the same frustrations – crowds, couldn’t park our RV, etc. But we went for a few of the further arches and enjoyed them without the crowds. I love people-watching – and I think you do too! We used to go before dawn and would be leaving as folks were coming into the park. It was in the heat of the summer so I suspect that it would be enjoyed even more in cooler weather. Sometimes we’d go back at dusk. I had read Abbey, as well. We went back to Arches a few times, and I kept thinking about the vast parts of the park that are empty–if I’m remembering correctly those are the places that Abbey wrote most about. I think, since it’s an easy climb, people are drawn to Delicate. You put into word the same feelings I have for the area, but in a way I cannot. 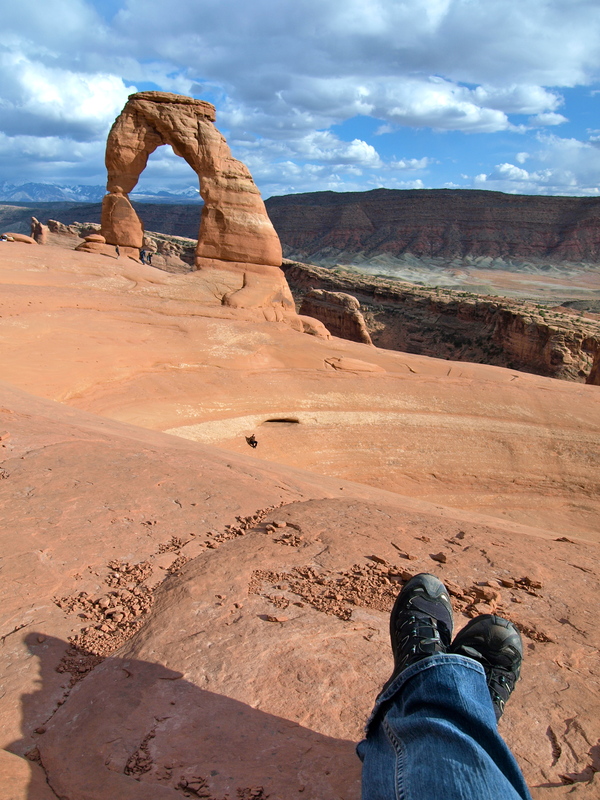 I have a similar picture of the maiden hike of my new boots in almost that same spot near Delicate Arch. I lived at Hovenweep for over 7 months, and loved seeing your photos of it. After a year in the desert, stuff, stores filled with stuff, the rabid need to acquire stuff, has become so foreign to me. As you so aptly described. I wonder if we will ever look at stuff the same again…thanks for this blog. 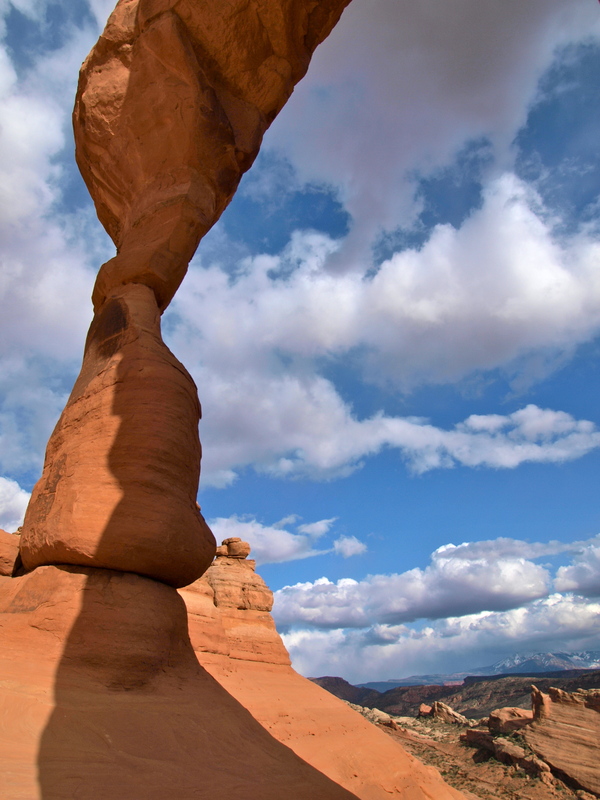 Found this as I looked up Delicate Arch while reading Abbey’s “Desert Solitaire”. Feels like the same kind of prose style. Look forward to more prose and pictures!